This is my fourth year and I would say I am a very satisfied customer and I also have 4 of my friends renting from this complex." 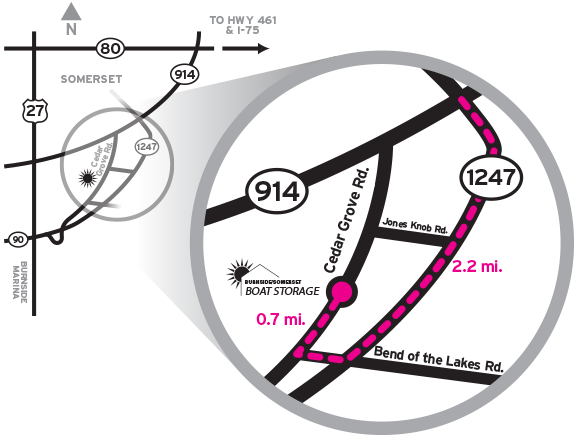 - 3 miles from Burnside Marina (3.5 miles from General Burnside Island). - Just 2 miles north of the Hwy. 27 & 90 intersection and, just 2 miles south of the Hwy. 914 By-Pass on Cedar Grove Rd. Turn south onto Highway 1247. Go 2.2 miles and turn right onto Bend of the Lakes Rd. Take a quick right onto Cedar Grove Rd. We’re located just 0.7 miles on the left.